Building to net zero means creating a home that produces as much energy as it uses. The concept begins by making the building envelope (the outside perimeter of the home) as energy efficient as possible. We work to make the walls and ceilings as air tight as possible with a high level of insulation. As the wall assembly gets more efficient the next weak point is often the windows. Working with an energy engineer we can identify what improvements will make the most impact and be most cost effective. Once we have the envelope the way we like it we work through the mechanical systems, lighting, appliances and other energy consuming devices to make selections that are appropriate for the home and it’s energy goals. Once we have minimized the energy consumption of the home we can add enough renewable energy to offset the consumption of the home. This is usually solar panels. 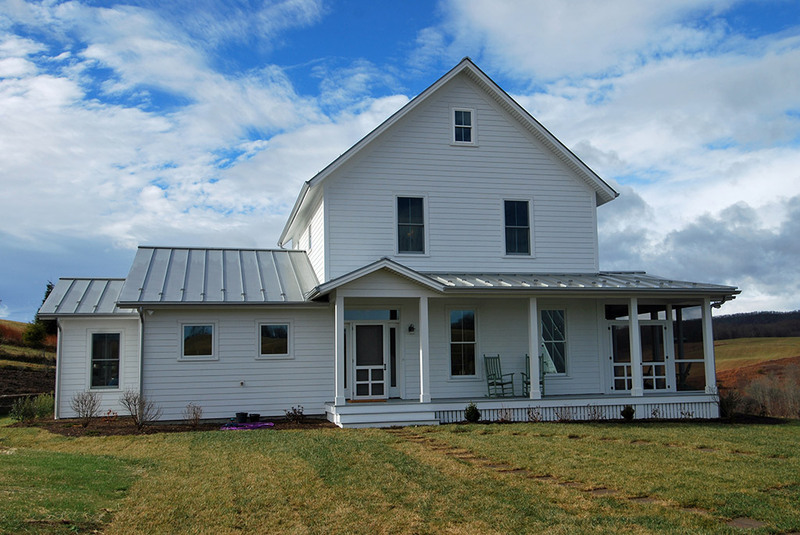 This home in Craig County gives up nothing in style and livability to achieve its net zero status. Built on a site where the owners lost their previous home to fire they paid close attention to style and details throughout the planning and construction of the home. The walls are 2x6 with blown cellulose cavity insulation. The exterior of the walls is wrapped with 1 ½” of rigid foam board to bring the R-value of the wall to R-30+. The ceilings are insulated to R-70. Most of the windows are triple paned which increases their efficiency by ~50%. This 2,917 sf home uses only one 2.5 ton heat pump to condition the space. The system is split into 3 zones to provide maximum comfort. An Energy Recovery Ventilator is a mechanical system bringing fresh air into the home. Running continuously this system pre-conditions the incoming air providing a constant source of fresh air and diluting any pollutants brought into the home. The solar array consists of 33 ground mounted solar panels. Ground mounting a system can maximize efficiency through proper orientation and angles. A second home completed this year achieved near zero status, being just two points off of net zero. This Blacksburg home uses much of the same construction techniques as the Craig county home. This home, in a subdivision setting uses a roof mount solar array. The HERS rating chart has been adopted by the DOE for their Energy Star program. Energy raters input a variety of data about the air tightness, insulation, mechanical systems, etc. to establish this rating. The annual average score for Shelter Alternatives homes has dropped from 56 (44% more efficient than a code built home) in 2011 to 23 (77% more efficient) in 2016.